Sarah Cooks: Happy Days with The Naked Chef and "Chicken in Milk"
Happy Days with The Naked Chef and "Chicken in Milk"
I recieved Happy Days with the Naked Chef for my 21st birthday last year, but have only recently got around to opening and reading through it. (This is why.) I'm also cooking for a scary real grown-up dinner party on Sunday (more on this later), which has made me go searching frantically through all my cookbooks trying to find suitable recipes. So anyway, Happy Days is a really great book. As I was flipping through it I made a list of all the recipes I'd like to try (regardless of dinner parties). Sounds delicious, yes? Please check out this book! 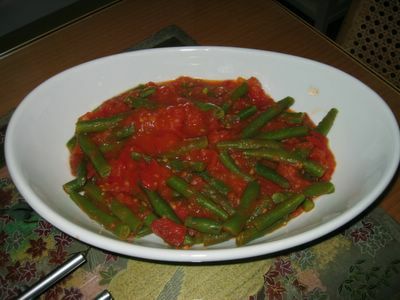 For Monday dinner I made the interesting-sounding chicken in milk, served with mashed potatoes and green beans in tomato sauce (adapted from Jamie's recipe for runner beans in tomato sauce). ...and put it in the oven for 1.5 hours (no lid). Whilst it was in the oven, I made the beans and mashed potato. For the beans, you make a tomato sauce by frying some garlic, adding a tin of tomatoes and letting it simmer for 15 minutes. Then you add some boiled beans. Ta-dah! 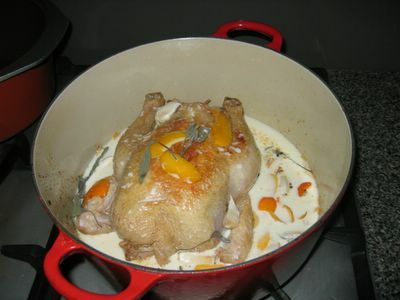 In the recipe, Jamie says to remove the meat from the bones and serve it on a plate. This sounded like way too much effort, especially as I was only eating with my parents. 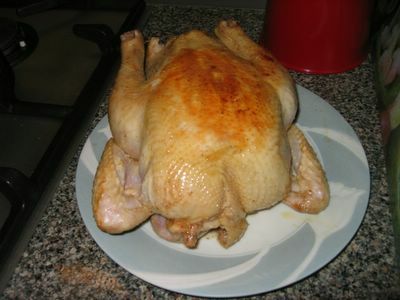 So I just put the whole chicken on the table, and we ate it like that. Wonderful! Being cooked in milk makes the chicken skin deliciously bronzed and crispy, whilst the meat absorbs the flavours of the sage, lemon and cinnamon. The buttery, curdy sauce is also very tasty spooned over mash. It was quite a low-effort supper in total (as soon as the chicken goes into the oven it needs no further interference), so I definitely intend to keep this in the repertoire. You must make the chocolate cambridge pots - they are amazing! They would also be very good for the dinner party - I know I'd be delighted to have them served to me at any time. They are like a chocolate creme brulee with a lovely gooey chocolate sauce at the bottom. Good luck with the dinner party! This was my first JO book, and my first "nice" (read expensive) one. I love it too. I have made this chicken, I must make it again. 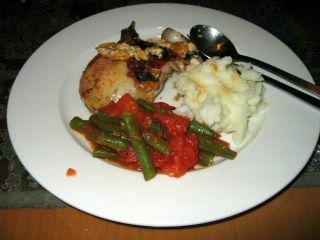 I also made his Dad's stuffed chicken, (my first recipe out of the bok) sensational! Some of the pasta dishes are great and I make them over and over again (like the broccoli one). I actually made the chocolate Cambridge pots for a dinner with friends last night. They were lovely, but so rich!! I'll put photos up tomorrow. Julie - mmm! 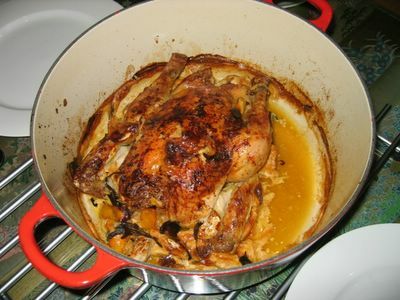 Glad you recommended Jamie's Dad's stuffed chicken; it looks great! Have you ever cooked pork in Milk? Classic Italian dish by Marcella Hazan. Its supposed to be really good. Hi Sarah, I've made this too & it is fantastic. 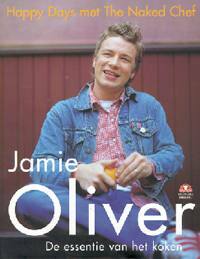 This is a great book that I keep going back too, check out the recipes listed under this cook book in my index to see the ones I have got around to blogging about. The brunch breads are very impressive if invitin people over for brunch & the curry I love & have made heaps of times! That chicken looks great even before going into the oven! Great job! It's a nice book, I think, w/creative but not kooky ideas. I just made this chicken dish this week - I've had that book for a while and never used it before. It was better than I thought it would be!